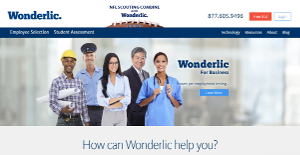 Wonderlic is an employee and student assessment application enabling businesses to make fact based decisions regarding selection of human resources. The software presents a set of intuitive features which can help you grow your business by utilizing the most eligible personnel for the job. Modern businesses are all about smarter selection of candidates and Wonderlic is exactly the tool that gives this power to the users. By making use of the testing and filtering features, you can grab the best of talent in the market, and take your business to new heights. Regardless of your business size and type, Wonderlic can give you the results you might be looking for. It is because of this that over the years, some of the best names in the market have started using Wonderlic. Deciding on which candidate should be hired is not an easy job. This is where Wonderlic comes in handy, as it makes decision-making way simpler. You can now put your potential employees under several tests through Wonderlic’s assessment modules. These modules are so intelligently designed that they test the candidate’s response to almost any type of situation. The motivation potential assessment module monitors you candidates’ preferences. This in turn proves to be a vital variable when it comes to efficiency. It observes employee attitude and behavior towards a certain situation to see how they can come good to your business. Each business demands a different skill set, and therefore, the rules must remain flexible. For this reason, Wonderlic has different scoring ranges for different types of businesses. Also, within a company, there are different ranges for each of the job types. Hence, the results are not just based on numbers but artificial intelligence too. The user interface at Wonderlic is also very simple. It makes the job easier for the HR officers when they collect data and extract results. For instance, there are simple red green and yellow indicators to give you an understanding of an employee’s performance in a test. To make life easier, you can set data filters to reach your desired results quicker. Similarly for educational institutes, there are student assessment modules where you can test soft skills and competency. In addition to that, there are surveys and curriculum assessment features also available in this software. If you are interested in Wonderlic it may also be a good idea to analyze other subcategories of Best HR Software listed in our database of SaaS software reviews. Each business has its own characteristics, and can need a specific HR Software solution that will be designed for their company size, type of customers and staff and even specific industry they support. It's not wise to count on finding a perfect solution that will be suitable for each company regardless of their history is. It may be a good idea to read a few Wonderlic reviews first and even then you should keep in mind what the software is intended to do for your company and your employees. Do you need an easy and straightforward service with only elementary features? Will you really use the complex functionalities required by experts and large enterprises? Are there any specific features that are especially useful for the industry you work in? If you ask yourself these questions it will be much easier to find a reliable solution that will match your budget. How Much Does Wonderlic Cost? We realize that when you make a decision to buy HR Software it’s important not only to see how experts evaluate it in their reviews, but also to find out if the real people and companies that buy it are actually satisfied with the product. That’s why we’ve created our behavior-based Customer Satisfaction Algorithm™ that gathers customer reviews, comments and Wonderlic reviews across a wide range of social media sites. The data is then presented in an easy to digest form showing how many people had positive and negative experience with Wonderlic. With that information at hand you should be equipped to make an informed buying decision that you won’t regret. What are Wonderlic pricing details? What integrations are available for Wonderlic?